Goodbye grey drizzle, hello blue sky! That gloomy January feeling is hard to shake, but booking a nice dose of sunshine should do the trick. What’s more, these boutique hotels are all adults-only, so you’re all set for some peaceful poolside lazing without any disturbances. Saved from ruin by 2 architects, a historian and a teacher, this beautiful townhouse in pretty Olhão has been converted into an airy and peaceful retreat. 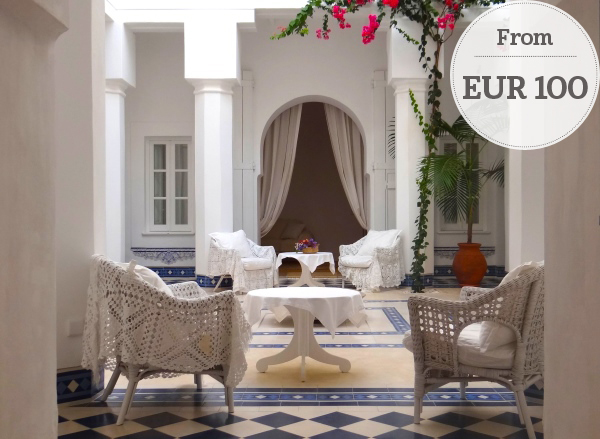 Whitewashed walls, smart wooden doors and a blue-tiled courtyard give the place a distinctly Moroccan feel, and the 9 bedrooms with their handwoven rugs and pretty antiques are wonderfully romantic. The rooftop terrace pool is an ideal spot for lazing and taking in the views of the Ria Formosa Natural Park. 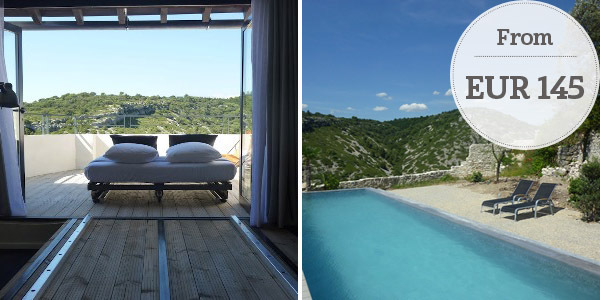 This 5-room, zen-like B&B is a real treat for any Francophile: the light and airy house sits in a pretty Provençal village and comes with a small spa, an infinity pool and views over Mont Ventoux. It’s ideally placed for exploring the region, and we reckon you could easily spend 10 days discovering off-the-beaten-track villages, walking pretty trails, browsing markets, sampling the local food and wine, and of course just drinking in those amazing vistas. We loved standout room Sous les étoiles, whose bed can be wheeled outside for a night under the stars. 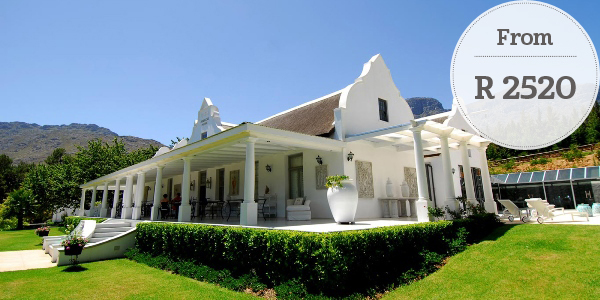 Set in a tranquil valley on a working wine estate, this Cape Dutch country house offers class and style in spades. Exquisitely decorated, the 6 rooms and separate Romantic Cottage are palatial yet still homely. If you tire of lounging by the pool or admiring those fantastic views, there are plenty of walks to enjoy within the estate. The Cape’s famous wine routes are within striking distance, and more adventurous activities like horse riding and quad biking can be organised nearby. 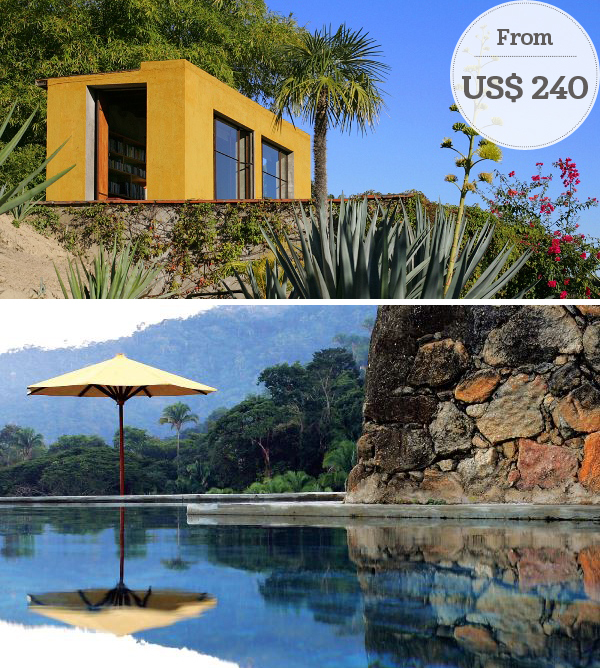 Those with a love of beauty, intimacy and nature will adore this boho-chic retreat, which sits on a lush hillside above Mexico’s stunning Bay of Banderas and is accessible only by boat. The quirky houses, some with 4 walls and some open-sided, are hidden in the jungle but still feature all your creature comforts, from comfy beds to lavishly stocked bathrooms. Wildlife lovers can book bird walks and whale watching, the spa has blissful massages, and every spot from your terrace to the communal pool is made for relaxing. i-escape guests say: “Wonderful place with fantastic views from heights; beautiful sunrises and sunsets different daily. Great trip to Marieta Isles. Opportunities to bird-watch, paramotor and parasail, plus private trips to other beaches in case you had enough of the home ground. Guests need to know that they have a real climb, not just a toddle, up a clear stone path from the landing jetty to the houses; glorious when you get there. 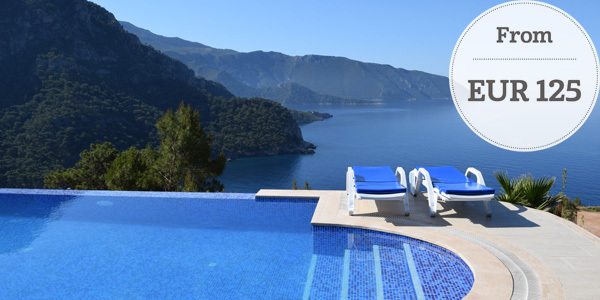 This great-value hideaway sits high above the turquoise waters of stunning Kabak Bay. The 11 wooden bungalows have floor-to-ceiling windows to allow the jaw-dropping views to take centre stage, and all are supremely comfortable. The kingsize beds are four-posters, the wooden furniture locally made, and the marble bathrooms spick and span. We feasted like kings at every meal – good fuel for the steep walk back up from the beautiful beach. We loved everything about this place, and the friendly British owners have set the bar high for new small hotels in Turkey. Check out our full selection of adults-only hotels.